Being in a band is all about fits and starts, it is an unfortunate part of the business and the life of a musician. Creative lapses, industry red tape and line-up changes hamper the progress in between releases and before tours. As frustrating as these stalling moments can be, most if not all bands come out the other side with something positive to show for it. Groups that don’t survive don’t show anything at all in the end. The Rational Academy is one of those bands that manages to roll with the punches and are still able to produce stellar music. Most people who follow Brisbane music recognise this band as ‘one of the good ones’ because every release and every live show impresses. They have impressed locally and abroad, earning acclaim with early albums compiled of lush, unique songs. This didn’t deter fate from throwing a few hurdles along the way, but so far, each hurdle has been hurdled with The Rational Academy emerging as an improved re-invention of the previous iteration, continuing to hurtle towards new things. For Benjamin Thompson and original songwritng partner, Meredith McHugh, the modest beginnings of a sonically skewed indie-rock band rapidly evolved into something bigger, a band with a statement sound. Although Meredith departed the band before their sophomore album Swans was recorded and released in 2009, Benjamin has continued the evolution and maintained the dedication to the project that was still earning acclaim. Although The Rational Academy have been particularly quiet over the past two years, excitement is picking up around town after a new line-up was put together with talented Brisbane musicians. The Rational Academy will soon put out their next long-play statement, and I don’t think I’m the only one eagerly waiting. It’s been a long journey since their inception in 2004 though. The duo and original Iron On drummer Nicola Phoenix, started working on songs that would be released in the form of two 7” records and one full length album, A Heart Against Your Own, which put the band on the map. A band initially following the tried and true indie-rock formula suddenly came out with a series of releases that has been described as ‘cut-up folk’ and ‘avant-garde’. According to Ben, this was a result of a concerted effort to think outside the proverbial ‘box’. The successful partnership between Meredith and Ben resulted in a plethora of recorded material (six songs were written in their first rehearsal together, all of them were used at a later point) that would eventually be sculpted into their first album. I say eventually because Ben readily admits they took their time about releasing it. While Ben is unashamedly truthful about his feelings toward the record, he is correct about the warm reception it received. Many reviews praised the ‘shimmering’ electronic-infused nature of the music, which up until that point had been buoyed by melodic guitar rock. This is a pretty good start for any band, right? The upward trajectory of The Rational Academy was plain to see. A few BIGSOUND appearances and some touring around the place and things were looking great. Meredith departed the band in 2009 on amicable terms to live in Baltimore. This put a halt on proceedings and Ben was left to create on his own for the most part. Ben continued on his own with further help from Lawrence English to create a suitable follow up – one where Ben could flex his creative muscles on an album that he could make sense of. A second album was created and then shelved for undisclosed reasons, and the next release anyone heard, Swans, followed on a path that had led from this mysterious unreleased release. Ben mentions that he and Meredith had been recording an album with a completely new line-up before her departure, which may have indeed been the second release. Regardless, Ben and Lawrence decided to work as a duo on Swans, bringing in guest musicians when it was required. Once that was finished however, it still left Ben without a solid line-up to make up The Rational Academy. So three odd years removed from Swans, The Rational Academy now has a solidified line-up. 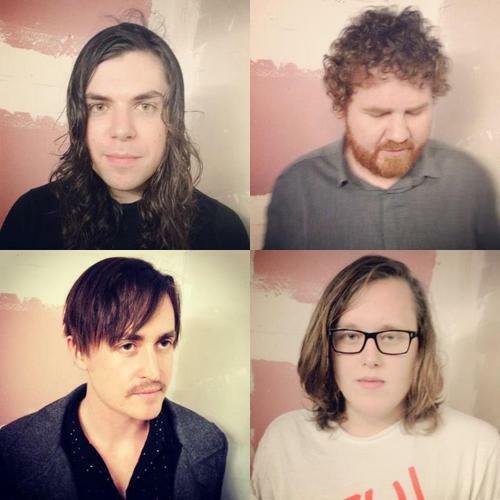 Tape/Off’s Luke Zahnleiter plays guitar, Thomas Roche plays the drums and the most recent addition is Matthew Cook on bass, joining the band approximately six months ago. A new album has been finished as of July, the wait for release is upon us. I asked Ben what to expect this time around. Each member of the line-up comes from different musical backgrounds, and each have other projects that are stylistically different (Tom performs in a Black Metal band; Matt performs electronic music under the name White Palms). I was surprised when Ben tells me that if anything, the sound of their new album could be more stripped back than before. Before you start thinking that this is going to be a straight up indie-rock record, keep in might that The Rational Academy has never played music ‘straight-up’. Ben is adamant that the meeting of minds on this record will keep things interesting. This must all be comforting to Ben as by his count he has seen eight different line-ups in The Rational Academy since its inception. Regardless, Ben is as comfortable as he has ever been with the sonic direction his band is taking. Change is a part of the game, and regardless of personnel, he’ll be trying something new. When the album comes out, hopefully we can all appreciate the new approach and give credit to a band that manages to change the game as often as it changes drummer. Jokes aside, I’m pretty sure Ben is hoping he doesn’t have to find any new musicians for a while.